A unique currency is an instrument capable of destroying the EU economy, and countries should be able to leave the euro if they want, leader of the French National Front (FN) Marine Le Pen said at a gathering of Europe’s right-wing parties in Germany. Speaking at a meeting in Koblenz, Germany described as an “EU counter-summit,” she predicted Brexit would trigger a domino effect. “The key factor that is going to set in course all the dominoes of Europe is Brexit. A sovereign people chose... to decide its destiny itself,” Le Pen said. “We can transform this ideological victory to a political victory and put an end to this ultra-liberal, anti-democratic world where non-elected people … decide for others without even facing opposition to their interests,” she told reporters after the conference. She particularly attacked the German Chancellor Angela Merkel, who she said “did colossal damage to the French and German people” and “contributed to absolutely uncontrolled immigration, which no one can handle any more” referring to Merkel’s so called ‘open door’ migration policy. Le Pen also said the policy of austerity advocated by the EU “has created poverty” and has led to the “suffering” of many German and French people. The right-leaning gathering comes a day after Donald Trump was sworn in as US president, and the right-wing Dutch MP Geert Wilders was quick to seize the initiative, “Yesterday, a new America. Today, hello Koblenz, a new Europe!” Wilders said. “The people of the west are awakening. They are throwing off the yoke of political correctness. This year will be the year of the people... the year of liberation, the year of the patriotic spring,” he added. He also added that those migrants, who “abide by the laws and our constitution and our values, are welcome to stay” but those, who “commit crimes, start implementing Sharia law and commit terrorist acts” should not only face punishment but should also be “denaturalized” and “sent packing out of the country immediately” after serving jail terms for their crimes. In the meantime, around 3,000 activists protesting against the summit of the right wing parties have gathered outside the venue of the ‘Freedom for Europe’ congress in Koblenz, AFP reported, citing organizers. “Koblenz stays colourful – No room for rightwing populism,” banners held by demonstrators read. The gathering was organized by a group operating under the umbrella name Europe of Nations and Freedom (ENF). 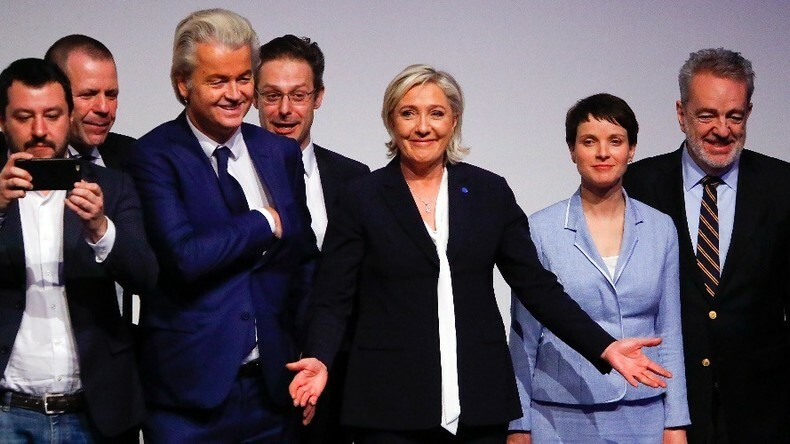 Founded as a European Parliament political bloc for parties with similar ideals, ENF says its core mission is to unite people opposing “supranational bodies and/or European institutions.” Its board includes Le Pen, Alternative for Germany Party (AfD) member Marcus Pretzell, and Geert Wilders. “Our plan is to build a Europe that respects the inalienable right of the European peoples to self-determination, to form a grouping of countries cooperating freely with each other,” ENF said in a statement.